Can Your Sales Team Make You into a Top Quartile/25% Company? Three out of four companies you know are not in the top quartile. By definition they are underperforming. Over the next few Insiders, we will provide tools to help you to assess whether or not your sales team has the capacity to help you grow your business into a top 25% company. One of the keys to becoming a top quartile company is having consistent and growing revenue. Revenue growth depends on the effectiveness and efficiency of your sales channels. While creating and cultivating your online presence is certainly a key part of supporting sales efforts, most of our clients depend on having sales people who are experts at cultivating client relationships. According to The Sales Board research, there are five factors that most positively impact sales performance. This data set was compiled over 20 years and tabulates the results from over 400,000 salespeople from over 3,500 companies in a broad range of industries. This week, we’ll help you understand the value of The Buyer/Seller Relationship and Sales Call Planning skills. On the surface, creating the Buyer/Seller relationship seems like it should be straight forward. Isn’t that what salespeople do? But if you were to talk to most people involved in sales, they could not tell you exactly what they are doing to develop that relationship. Every buyer makes five critical decisions along the path of coming to a buying decision. But did you know that these decisions come in a certain order? At the core of building a solid Buyer/Seller Relationship is knowing and following the client’s readiness to walk the five critical decisions—in the right order!—along the way to making a buying decision. Following this order is key to building a successful relationship. The second critical skill salespeople need is Sales Call Planning. Unless the salesperson knows where a potential client is in the five step decision-making process, s/he cannot successfully do Sales Call Planning. The sales person must first have a certain knowledge of the science of the five essential selling skills critical to success. And, most importantly, using that knowledge, applying those skills on the job is, of course, the only way to improve actual sales performance and insure revenue growth. In the chart below, the two bars on the left indicate Knowledge measurement. The two bars on the right indicate Application measurement. The blue bars indicate average assessment scores prior to training. The green bars indicate assessment scores post-training. Before training, salespeople had a reasonable amount of knowledge (64%), but the ability to apply sales-call planning skills was surprisingly low (37%). Salespeople are powerful problem-solvers with a rich set of people skills but they are generally poor planners. Post-training salespeople saw their Knowledge scores rise to 83% and their post-training Application scores of 82%. These percentages show that salespeople, when they return to the job, actually use nearly all of the skills they learned. Salespeople are outcome-driven: they don’t get paid until the sale is completed. Therefore, once they make the connection that planning can be the key to their success, they are very motivated to master this skill in setting the right kind of objectives for each sales call. 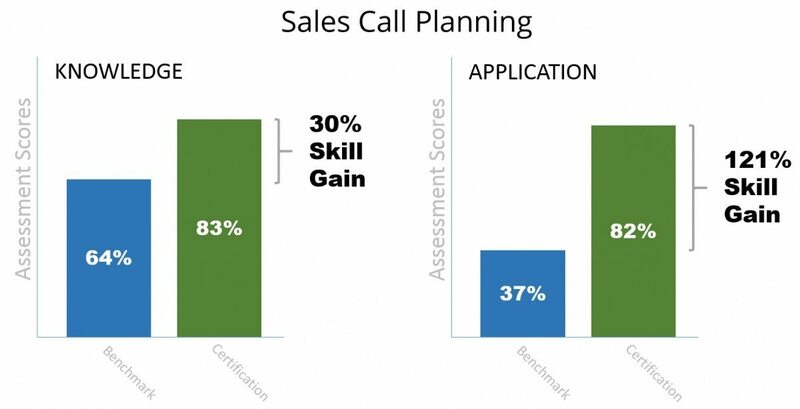 Note that the 121% Skill Gain in Sales Call Planning. No other skill in the research posted such a high gain. This suggests that it is the No. 1 high payoff skill to focus upon in training. Look for future Insiders when we’ll be discussing how salespeople improving their Questioning/Listening, Presentation and Gaining Commitment skills can help your company move into the top 25%. Contact us if you’d like to learn what the five critical buying decisions are.